The cultural marginalisation of animals, as author John Berger defined modern man’s perception of animals throughout the 20th century, has relegated animals to the status of consumer goods, along with a range of other products of capitalism. The perception of animals that includes notions of coexistence and magical beliefs–which man once held in relation to animals–is an outmoded archaism. Today, animals are needed for food, for fun and as pets. At one end of the scale, in the meat processing industry, they are treated as any other product. At the other end of the scale, pets are entirely personified, their owners often regarding them as appendages to their personalities and part of the family. Exotic animals are taken from their natural habitats and put on display as rare commodities in the embellished atmosphere of a zoo. Tomaž Črnej’s photographic series In the Gallery is born out of the artist’s need to examine the cultural and behavioural patterns we adhere to. Nowadays, as a result of the differentiation of production and consumption within the capitalist system, the consumer of the ‘end product’ is entirely detached from the process of its creation. This detachment conveniently enables the concealment of what could disturb, upset, or in any other way serve to discourage the consumer from buying the product. In relation to this, the aritst asks (himself): Are we ready to truly see what we know exists? Thus, the series deals with the part of the meat processing industry we are often unaware of, or choose to ignore, when buying its end products – i.e. animal slaughter. 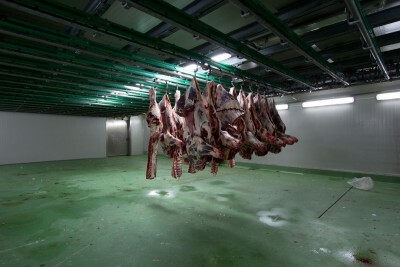 As a meat eater, Črnej was interested in the phase of meat production that he is spared from seeing as a consumer: The slaughterhouse. Unlike photographer Stojan Kerbler in Pig Slaughter (Koline)–a series first exhibited in 1982 in which the author documents pig slaughter in Haloze in the 1970s–Črnej avoids the area where animals actually get slaughtered and focuses above all on the areas where meat is processed. With their coldness and sterility, the emptied-out rooms of the slaughterhouse seem surreal, only just hinting at their true purpose. If Pig Slaugher does emanate a whiff of ritual sacrifice, slaughterhouses symbolise exorbitance–a feature symptomatic of capitalism. They speak of excessive production and of man irrevocably taking up the position of the most powerful species by cultivating animals, and in so doing has interfered with nature to the point where nothing in it is natural, not any longer. The exhibition is open until 1 July 2016.